Welcome to week 4 of our What’s Up World series—each week my children and I read about a different county and cook a meal from that location. Our travels this week took us down to South Africa, a country that’s on my personal bucket list to visit one day (and for now, this will have to do!). We read about the idea that South Africa is sometimes called the rainbow country because people from so many different countries have settled there. You could say the same about the city where my family lives, too—we’re a part of a community where there is a lot of diversity of race, nationality, and religion—and I appreciated the opportunity to reinforce what I always tell my children at home: that God made everyone different and everyone special. In the book, the narrator's meal choices also hit home—he ate cereal for breakfast and macaroni and cheese for lunch. And then we got to the narrator’s dinner and the kids almost fell out of their seats. On his family table was tripe, a disguised word for sheep stomach. My kids begged me that the meal we choose to make NOT be tripe, and I agreed that it was something that none of us could stomach (<—see what I did there?). So instead I consulted with my friend Sharon from www.cookingwithkidsNY.com who teaches international cooking classes and whose trips have taken her around the globe. She suggested that we make Githeri, an African stew made of beans, vegetables and spices. It sounded perfect! Admittedly, this recipe required a lot of chopping, but my kids didn't mind one bit. The boys are thrilled any time they get to use their knives (we use these kid-friendly ones from Curious Chef), and they went to work chopping up peppers and scallions while I handled the the heartier potatoes and carrots. Once the veggies were all in the pot, we took turns smelling spices: curry, ginger, and coconut cream. I love watching their reaction. My 3 year old loved the smell of the curry while my 6 year old wrinkled up his nose at the same smell. They both agreed that coconut cream was something we should have every day, and it was hard to get them to stop sneaking tastes. Lastly, we dumped everything in a slow cooker and let it do its thing. On busy summer days it’s such a treat to come home to a done dinner and spend an extra half hour at the park rather than forcing everyone to retreat early so I can cook. For fun, I served this over alphabet-shaped pasta, but rice, quinoa or pita bread would make a nice substitution. Getting kids to eat new flavors can be challenging, but getting them involved in the cooking process almost always guarantees that they'll try it. If I were to serve this blindly, I can bet that it would have been a struggle for them to take a bite. But this time, they ate it happily and proudly showed my husband what they had made. I too enjoyed the flavors and I plan to experiment with other vegetables depending on what's in season. This meal would freeze easily, so you could even make it in bulk and then freeze a portion for the future. But for now, we're closing out our chapter in South Africa, and flying back to Asia. China, we're coming for you! Directions: (for the slow cooker) Add all ingredients to a slow cooker through cilantro and mix well. Set on low and cook for 8 hours. Season to taste with salt and pepper. Garnish with cilantro. (for the stovetop) Heat a large dutch oven on medium heat and add the vegetable oil and butter. Add onions and cook until translucent. Add the ginger and garlic and cook for 1 minute more. Add curry powder and cook another 1-2 minutes. Add tomato puree to the pot. Reduce the heat to a low simmer for 5 minutes or until the mixture thickens a bit. Add the potato, pepper, carrots, scallion, corn, beans, vegetable stock, coconut cream, salt and pepper. Cook, stirring occasionally for 20-30 minutes until vegetables are soft. Add cilantro and cook several minutes for the flavors to mix. Season to taste with salt and pepper. *Traditional canned beans contain a high amount of sodium. Rinse before using or look for low sodium or organic beans instead. We're continuing our virtual trip to the beautiful county of India (if you're new here, you can learn more about our adventure HERE to join us--it's never to late!). This country, I told the boys, was ALL THE WAY around the world, and they used that information to spend the next three minutes fighting over who could spin the globe to the other side because nothing brings out that special side of siblings like summer vacation. Once both had the opportunity to spin that very object that's on display every day but otherwise gets ignored lest the other shows interest, we moved on to reading all about this special country. Like the book we read about Brazil, the story about India was narrated by a school-aged girl, and this one had 56 kids in her class. I was surprised to learn that schools are so full in India, that students are divided into two groups--those who attend school in the morning and others who go in the afternoon--to keep up with the demand. We finished the book and I couldn't wait to move on to trying the recipe. I wouldn't dream about writing about Indian cuisine without consulting my friend Kanchan who grew up there but now lives in Brooklyn. Her cookbook and blog, Spice Spice Baby, include recipes that span from babyhood to adulthood and will inspire you to experiment with all different kind of spices. She also has a Ph.D. in Biomedicine from Harvard (#girlpower for real!) and I love how she incorporates the information about healing power of various spices into her cuisine. We decided to make these super flavorful chicken kebabs from her cookbook that happened to be her childhood favorite food. On her son's first trip to India, her mother cooked these same kebabs for him, and he devoured them just as she had done as a kid! I personally like using familiar foods as a vehicle for introducing new flavors, so I was excited to make these with my kids. Plus, anything on a stick is always fun to eat and inevitably turns into a kebab sword fight. Ah, boys. I chopped up the onion, garlic and ginger while the kids picked off leaves off cilantro and mint. I set out a cutting board and asked them to put the stems in one pile and the leaves in the other, and they went right to it. We also took turns smelling the ginger, garam masala, garlic, and herbs. Once we blended up the herb mixture in the food processor, I sealed off that and the chicken in a large zip lock bag, and the kids got to squish it around to evenly distribute. I left the kebab skewering to yours truly because there wouldn't be enough bandaids in the house to cover the potential boo-boo damage otherwise. My whole family ate these right up, including my 1 year old whose chicken I chopped into tiny bite size pieces. These make a great flavorful food for baby-led weaning. Introducing infants to a variety of herbs and spices can make them better eaters--in fact studies show that the more flavors a baby is exposed to before age 1 translates to the more variety of foods they eat at age 7. We're having so much fun with this series, and can't wait to land in our next stop: Italy! In a food processor, blend together the first 7 ingredients until onion, and herbs are minced and mixed well. Transfer meat and herb mixture to a a gallon sized ziplock bag and mix well. Mold the meat mixture into 2-inch long kebabs and set aside. Heat a grill pan or skillet to medium and brush lightly with coconut oil. Cook the kebabs, turning them every minute or so for 10-12 minutes to ensure even cooking all around. Brush the kebabs with coconut oil while cooking, every few minutes, to prevent them from drying out. If cooking in batches, avoid over-crowding and brush the skillet with more oil as needed between batches. Check one kebab for doneness – it should not be pink in the middle. Serve with a cilantro and mint yogurt sauce or enjoy with a squeeze of lemon. Freeze the cooked kebabs for up to 3 months – just thaw and reheat on a grill pan before serving. Remember the international vacations you used to take with your spouse before you had children—the afternoons spent wandering down foreign cobblestone streets, sauntering through museums, and enjoying a leisurely glass of wine at at outdoor cafe? This is nothing like that. (What? You have kids now.) Instead, we’ll be exploring different cultures from the comfort of your own kitchen. There are no pricey plane tickets, no museum meltdowns, and no judgement if you choose to pour yourself a glass while you cook, because cooking with kids can have a common side effect of driving parents to drink. I kid, I kid. We started our trip in Brazil, and I was surprised to see how interested my 3 and 6 year old boys were in learning about the country and locating it on our globe. This particular book about Brazil was narrated by a school aged boy that my kids could easily identify with. Like them, he lives in an apartment in the city and wears a uniform to school. I liked that the boys could see themselves in the narrator, and we talked about how his life would be similar and different to theirs. I personally have found that motherhood is a role that makes the world seem so much smaller since we all share many of the same struggles and joys, and I hope that on some level, this book helped my kids feel this way too. For the recipe, we went with a traditional Brazilian baked empanada that they refer to as Pastel al Forno made with chorizo, potato, and bell peppers. In Brazil, they typically bake their empanadas instead of frying them, which makes for a healthier recipe and a quicker clean-up. I did most of the chopping in advance, and the boys helped me (I use the term "help" very loosely--ha!) by taking turns sauteeing the filling, spooning the filling into the disks, wetting the edges of the disks, and poking holes in the top with a fork so that the steam could escape. These type of empanadas, I told them, were Brazil's version of fast food--something you could grab and go as an afternoon snack or quick meal--though they were disappointed that I didn't know if kids' meals in Brazil came with a toy. It's been a while since I've cooked with my kids--evenings in the school year are just too chaotic--but I was pleasantly reminded how excited the kids were to have a hand in making the recipe and trying it. They couldn't wait to try the finished product and were so thrilled to shove food into their sister's mouth offer their sister bites of what they made. For us, this recipe was a huge success (my oldest ate 3! ), and I believe it was partly because they helped out and also because the elements inside the filling were familiar enough--they're used to eating sausage, potatoes, and peppers. I'm planning on making this again and using it for lunchbox stuffers throughout the week. You can also make extra filling by doubling the recipe below. Alone, it makes a delicious hash that you could top with a fried egg. Here's hoping the next stop will be as successful. Join us next week as we head halfway around the world to India! Make filling: Heat oil in a medium saucepan over medium heat. Add chorizo, onion, peppers and potato to the saucepan, and stir until vegetables and potato are fork tender, around 10-15 minutes. Add garlic and oregano, salt and pepper and cook for 2 minutes more. Cool filling to room temperature. Form empanadas. Preheat oven to 400 degrees. Line a baking sheet with parchment paper. Place a small bowl of water next to the disks. Place 12 disks on a lightly floured surface, and spoon 2 tablespoons of filling into the center of the disk. Dip your fingers in the water, and run them around the outer edges of the disk. Fold dough in half and seal the edges with a fork. Flip the disk and use the fork to crimp the other side. Poke a hole in the top of the empanada, brush with olive oil, and place on the baking sheet. Repeat with the remaining 11 disks. Bake for 15-20 minutes until empanadas are golden. Serve warm or at room temperature. *You can also use empanada discos found in the freezer section of the grocery stores--just be sure to buy the variety that are meant for baking not frying. I interrupt this recipe to share breaking news: A new highly scientific study found that calories consumed on holidays don't actually count. Are you convinced yet? Good, because you're going to need eggs (1 dozen), plain old white spaghetti (1 pound) and a teeny half pound of salty cheese. Are you still here?To the one person who hasn't clicked away in horror, you won't regret this. Because dishes created by authentic Italian Grandmas don't usually come with a recipe. But lucky for you, this was well studied as I made this alongside my grandma who told me every ingredient was measured "to taste." Hmmm... In case you're wondering exactly what the heck this is, macaroni pie is a classic Italian Easter tradition and something I look forward to every year. Unlike what its name suggests, macaroni pie isn’t actually a pie, it’s more like baked macaroni and cheese that’s cut into squares and served as an appetizer. But even that doesn't do it justice. It's salty from the freshly grated pecorino cheese, spicy from the large heap of pepper, and perfect in every way, You could serve it with a side of garlicky tomato sauce to dip, or even mixed in some steamed and chopped broccoli, but I like the way it is in its classic form--a no-frills, 4-ingredient classic. Preheat the oven to 350. Butter a 9×13 pan. Cook one pound of spaghetti according to the package directions. In a bowl, whisk one dozen eggs, 1/2 pound grated Pecorino cheese, and one tablespoon black pepper. Add the cooked spaghetti to the egg mixture (eggs will begin to cook a little, but that’s okay). Pour mixture into the prepared pan and spread into an even layer. Bake for one hour, covered with foil, until a fork comes out clean. One of the most common questions I get from parents who are making their own baby food is "What's next? "Once their baby has moved beyond single-ingredient purees, they're ready to introduce more flavors, but aren't quite sure where to start. The baby phase when your little one is happily gobbling up everything is THE best time to introduce a whole variety of foods. In fact, studies show that babies who are exposed to a variety of flavors before age 1 eat a wider variety of foods at age 6. Talk about a victory for pickiness! My philosophy has always been to cook once for everyone in our family--and with three kids 5 and under, it's a true sanity saver. For this recipe, I used both the zucchini and one batch of nut-free pesto to create meals for everyone from my 10-month old baby to my 40-year-old husband and everyone in between. My kids love pesto--they call it their favorite green sauce, and we put it on everything: as a spread on a sandwich, stirred into risottos, and tossed with pasta. I used a nut-free version here since I'm not quite ready to introduce nuts to the baby, and so that I dont have to worry about sending the kids to school with it on a sandwich. I also gave it an extra health boost by adding in a heaping handful of baby spinach, which has such a mild flavor that no one can tell the difference! The rest of the squash I left in the saute pan and continued with the pesto chicken risotto (the full recipe is below). It's an easy, veggie-packed, 1 pot meal that my family loves. I hope yours does too! NUT-FREE PESTO In a food processor, combine 1 bunch of fresh basil (discard the thick stems), a handful of fresh baby spinach, 1 garlic clove, juice of 1 lemon, 1/4 cup grated parmesan cheese, and a half cup of olive oil. Process until smooth, pausing to scrape down the sides of the bowl to incorporate all the ingredients. Directions: In a deep lidded skillet over medium heat, saute squash in olive oil until wilted. Remove 1.5 cups for baby food if using. Add rice, chicken, and stock to the skillet. Bring to a boil, then reduce heat, cover and simmer until rice is cooked through, around 30 minutes. Stir in pesto, adding more to taste. Serve with extra grated cheese. When spring has sprung but there's still a chill in the air, this dish is the dinner that's waiting for you to cook it. It has enough cheese to make it a comfort food for a chilly night, plus enough seasonal vegetables and herbs to make it both taste like springtime and redeem itself as a "it-has-green-veggies-so-it-must-be-healthy!" meal. For kids, it doesn't get more familiar than pasta with peas, which works to your advantage when introducing new flavors--starting with ingredients that kids are already familiar with is one of the best ways to expand their palates. In this case, your basic peas and pasta dinner gets upgraded with sugar snaps, lemon, mint, and basil to add tons of flavor and freshness for very little extra work. In fact, this whole dish comes together in as long as it takes for the water to boil and pasta to cook--and we bet you'll even have time to set the table too! Directions Bring a large pot of salted water to boil. While waiting, prep the remaining ingredients: Cut snap peas into thirds, zest and juice lemon, and chop up mint and basil. Cook pasta for two minutes less than the suggested cooking time on the package, then add sugar snap peas to pasta. Cook for two minutes more. Turn off the flame and stir in frozen peas until just warmed through. Drain pasta and pea mixture, reserving 1 cup of cooking water. Add pasta and peas back to the pot, drizzle with 2 tablespoons olive oil, ricotta, parmesan cheese, and 1/2 cup of pasta water, and cook over high heat for 1 minute, stirring constantly. Season to taste with salt and pepper, and add in more water if pasta looks dry. Right before serving, stir in mint, basil, lemon juice, and zest. Like every 4-year-old on the planet, my son alternates between stages of scarfing down everything in site and/or protesting via hunger strike when he decides he doesn't want to eat what's on his plate. The past few weeks, he's been doing the latter--refusing to taste his dinner, which culminates in his eventually going to bed without eating a full meal (not my problem) but then waking up before the sun because he's starving (my problem, indeed). Our dinnertime rule is pretty straightforward: You don't have to like what's served, but you do have taste what's on your plate before you decide that you don't like it. And to reassure you that I'm not a mean mommy who starves her children, I always include things I know they'll eat--some apple slices, cheese and crackers, whatever--so they don't feel the "this is all you get" pressure. But alas, a few measly sides don't sustain an active boy throughout the night. And with a newborn at home that awakens a handful of times for feeding, my sleeping until the sun rises is so very very precious. Enter this dish. It has everything we both want in a meal. He likes that it's spaghetti (and that I may or may not let him pick up strands with his fingers, tilt his head back, and open wide). I like that it's a one pot meal that everyone can eat, that it's packed with protein from the beans and noodles (I buy Barilla Protein Plus pasta, which is made with chickpea flour for added protein, and looks and tastes close to regular), and that it contains veggies that are shredded into such tiny pieces that they can't help but cling to the noodles and become all but impossible to pick out. Bring a large pot of water to a boil. Add a teaspoon of salt and pasta and cook pasta just shy of 1 minute al dente. Reserve the pasta water. Meanwhile, shred zucchini using a box grater (hint: hold the stem side to make it easier.) Set aside. Heat a large skillet over medium heat. Add olive oil and garlic to the pan. When garlic just starts to sizzle (but before it takes on any color), add shredded zucchini. Season with 1/2 teaspoon salt and 1/4 teaspoon pepper, and saute for 8 to 10 minutes. Add hot, drained pasta to the pan. Toss spaghetti with zucchini and garlic oil. Add cheese and toss pasta with tongs. If the pasta looks dry, add reserved pasta water (start with 1/4 cup and work up from there), tossing pasta as you go. Cook over the stove for 2 minutes more. Add lemon juice and serve. *When buying canned beans, always look for ones that are low sodium or organic, since regular ones contain tons of sodium. *If your child doesn't mind the "green things," this dish would be made even better with the addition of fresh chopped herbs (basil, mint, parsley, or a combination of the three would work), tossed in right before serving. The same is true for lemon zest. On our table at the holidays, my family rarely remains married to any one particular dish. We don't live by rules that say we have to eat THIS on Christmas, and THIS on Mother's Day, and so on. In fact, most of our holiday meals are new recipes that just sound really good but that we would never have time or energy to make on a normal Tuesday; a porchetta that takes 2 days to marinate in the fridge or a baked french toast with homemade berry sauce would never fit into my weekday routine. This recipe, however, is the exception in being both traditional and unfancy. Macaroni Pie--which isn't a pie at all, but more a combination of spaghetti, eggs, and an ungodly amount of cheese--has appeared on our Italian family's Easter table for generations. My grandmother learned the recipe from her mother, who learned it from her mother, and so on. And with a short list of humble ingredients and a prep time that's as long as it takes for water to boil, it's proof that simplicity often wins. We only see this recipe once a year, and I never understand why. It's a comfort food that everyone can agree on. 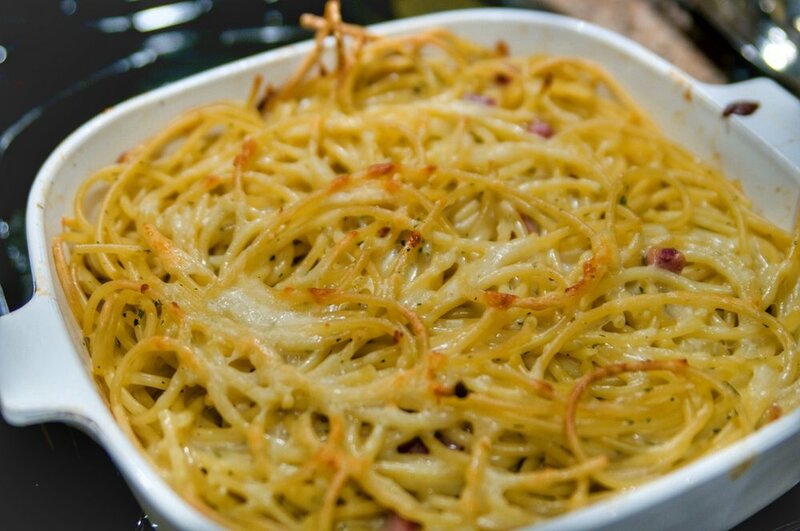 Adults love that it tastes like a baked version of cacio e pepe. And try arguing with your kid to taste a food that contains both Macaroni and Pie in its name. Additionally, the recipe can be made even more convenient by baking single servings in muffin tins, rather than in one baking dish as I do in the recipe below. Preheat oven to 400 degrees. Generously butter a 9x11 inch cake dish. Set aside. In a large pot, bring salted water to a boil and add spaghetti. 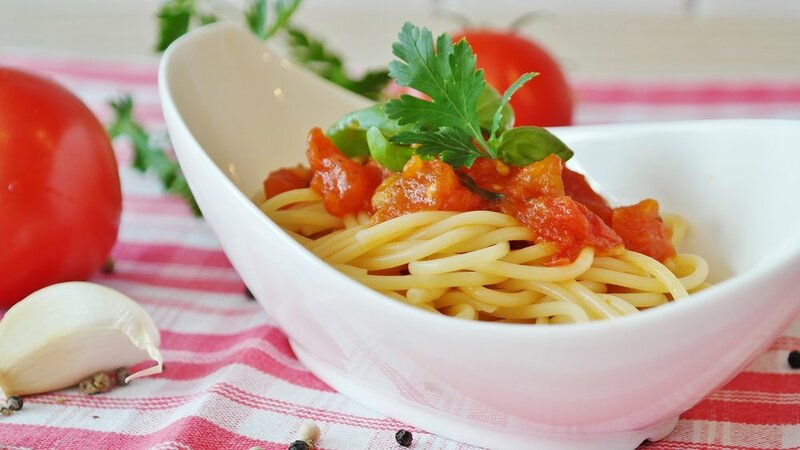 Cook pasta 2 minutes less than its suggested cooking time (pasta will continue to cook in the oven). While you're waiting for the water to boil: In a large bowl, whisk together eggs, cheese, and pepper. Add drained pasta to the bowl and mix together until combined (two forks or tongs usually does the trick). Pour into pan and spread evenly. Cover with foil, and bake for 35 minutes. Remove foil than bake for 10 minutes more until the top gets nice and crunchy. Let cool for 15 minutes and then cut into 16 slices. *This can be made up to three days in advance. Reheat, covered, in a 350 degree oven for 10-15 minutes. *If you're making this in muffin tins, we recommend parchment liners to prevent stickage. Also, to make filling easier, add the cooked spaghetti directly to the muffin cups and then use a measuring cup to pour the mixture over the pasta. Reduce cooking time to 20-25 degrees covered and then an additional 5-10 minutes uncovered.